Use of this content, the Mauldin Economics website, and related sites and applications is provided under the Mauldin Economics Terms and Conditions of Use. Participation in such activity is grounds for immediate termination of all subscriptions of registered subscribers deemed to be involved at Mauldin Economics’ sole discretion, may violate the copyright laws of the United States, and may subject the violator to legal prosecution. Mauldin Economics reserves the right to monitor the use of this publication without disclosure by any electronic means it deems necessary and may change those means without notice at any time. If you have received this publication and are not the intended subscriber, please contact service@mauldineconomics.com. The Mauldin Economics web site, and all of its current and future newsletters are published by Mauldin Economics, LLC. Information contained in such publications is obtained from sources believed to be reliable, but its accuracy cannot be guaranteed. The information contained in such publications is not intended to constitute individual investment advice and is not designed to meet your personal financial situation. Any views expressed are provided for information purposes only and should not be construed in any way as an offer, an endorsement, or inducement to invest and is not in any way a testimony of, or associated with, Mauldin's other firms. The opinions expressed in such publications are those of the publisher and editors and are subject to change without notice. The information in such publications may become outdated and there is no obligation to update any such information. You are advised to discuss with your financial advisers your investment options and whether any investment is suitable for your specific needs prior to making any investments. John Mauldin, Mauldin Economics, LLC and other entities in which he has an interest, employees, officers, family, and associates may from time to time have positions in the securities or commodities covered in these publications or web site. Corporate policies are in effect that attempt to avoid potential conflicts of interest and resolve conflicts of interest that do arise in a timely fashion. US regulations prohibit John from giving specific investment advice by email. Please go to www.mauldineconomics for more information. Mauldin Economics has affiliate agreements in place that may include fee sharing. If you have a website or newsletter and would like to be considered for inclusion in the Mauldin Economics affiliate program, please send an email to affiliates@mauldineconomics.com. Likewise, from time to time Mauldin Economics may engage in affiliate programs offered by other companies, though corporate policy firmly dictates that such agreements will have no influence on any product or service recommendations, nor alter the pricing that would otherwise be available in absence of such an agreement. As always, it is important that you do your own due diligence before transacting any business with any firm, for any product or service. John Mauldin is the Chairman of Mauldin Economics, LLC. 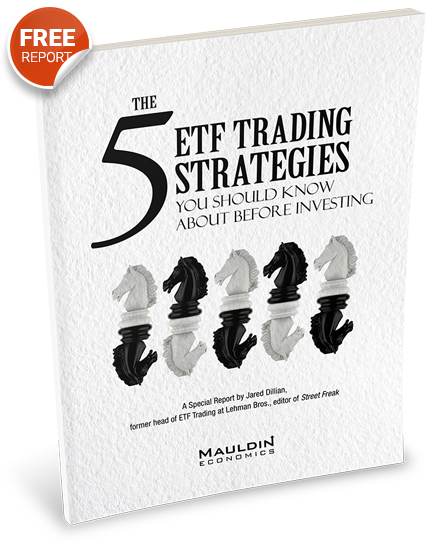 John Mauldin is also a registered principal of Mauldin Securities, LLC, a FINRA and SIPC registered broker-dealer. Mauldin Securities LLC is registered with the NFA/CFTC, as an Introducing Broker (IB) and Commodity Trading Advisor (CTA). Mauldin Securities, LLC can refer investors to private investment offerings with other independent firms such as Altegris Investments, Sanders Morris Harris LLC; Nicola Wealth Management or other similar broker/dealers. Funds or other investments recommended by Mauldin will pay a portion of their fees to these independent firms, who will share a portion of those fees with Mauldin Securities, LLC and thus with Mauldin. Any views expressed herein are provided for information purposes only and should not be construed in any way as an offer, an endorsement, or inducement to invest with any CTA, fund, or program mentioned here or elsewhere. Before seeking any advisor's services or making an investment in a fund, investors must read and examine thoroughly the respective disclosure document or offering memorandum. Since these firms and Mauldin receive fees from the funds they recommend/market, they only recommend/market products with which they have been able to negotiate fee arrangements. Please read the information on Risks page for further risks associated with hedge funds. This information is not to be construed as an offer to sell or the solicitation of an offer to buy any securities. This website has links to other agencies and organizations. When you go to another site through the links, you are no longer on our site and are subject to the terms and conditions of the new sites. Please review the privacy policies on those Websites to understand their personal information handling practices. We make no representations concerning the privacy policies of these third party Websites. Unauthorized attempts to upload information and/or change information on any portion of this site are strictly prohibited and are subject to prosecution under the Computer Fraud and Abuse Act of 1986 and the National Information and Infrastructure Protection Act of 1996 (see Title 18 U.S.C. ¬ß¬ß 1001 and 1030). © Copyright 2018 by Mauldin Economics, LLC.